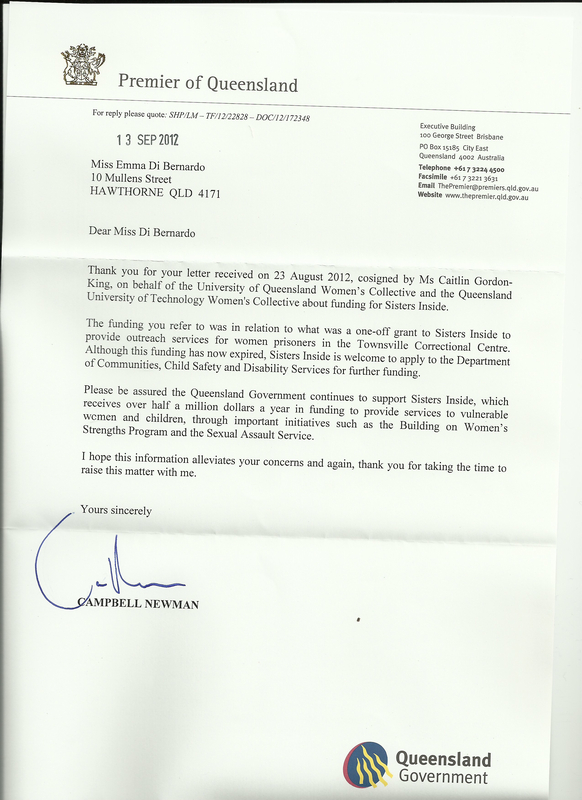 A few weeks ago we sent a letter to Premier Campbell Newman expressing our concern about his cabinet’s defunding of Sisters Inside’s outreach program, and asked him to kindly reply with his reasons for this defunding. This is his response, received on Friday. The following is a joint effort from the UQ Women’s Collective and QUT Women’s Collective: a letter we posted today asking Premier Campbell Newman to address the reasons why Sisters Inside Inc. was defunded, and to reconsider the defunding of this amazing service to women. It was mailed both to the Premier’s office and his Ashgrove electoral office. We’ll keep you updated as to his reply. If you would like to show your support for Sisters Inside, you can sign this petition! This letter is written on behalf of the members of both the University of Queensland Women’s Collective and the Queensland University of Technology’s Women’s Collective to express their significant concern regarding the state government’s recent decision to withdraw funding for the service, Sisters Inside Inc. Our collectives implore the government to reconsider this withdrawal for three reasons. Firstly, the reasons given for withdrawal of funds are not empirically credible. The Collectives’ research suggests that the government funds saved by the work of Sisters Inside greatly exceeds the cost required to enable that work. Secondly, the organisation provides crucial services directly contributing to the prevention of female crime and incarceration, and consequently, the wellbeing of women, their families and society at large. Finally, even if defunding was not likely to drastically impair these efforts, the symbolic nature of this withdrawal is psychologically damaging, socially unacceptable and ideologically invalid. The Women’s Collectives of both the University of Queensland and the Queensland University of Technology therefore urge the LNP not to undermine an organisation whose work is vital if the government is to fulfill its primary role – to uphold the welfare of the people of Queensland. The services provided by Sisters Inside are crucial to the maintenance and advancement of the welfare of women in prison. It not only provides counselling and support to help them overcome underlying issues and re-enter society after their sentence is served, but advocates fair treatment and fundamental rights whilst in gaol. Sisters Inside is an organisation that is there for women – mothers, daughters, sisters, aunts, friends like yours or mine – when no one else will be. It directly addresses the difficulties women have faced – often abuse and addiction – and provides them with the tools necessary to overcome these difficulties so they might lead happier lives and better contribute to society. Sisters Inside has been an outstandingly successful service that has greatly supported a vulnerable and otherwise disregarded demographic, and thereby has benefited the Queensland community at large. This benefit has not only been felt sociologically, but also economically. It is clear to us that defunding Sisters Inside will cost the government money in the long run, rendering it a purposeless and overwhelmingly damaging act. As a party that is intent on cutting costs to the Queensland electorate, it is surprising that the LNP has chosen to collapse an organisation which saves government money. It costs taxpayers $70,000 to keep one woman in prison for one year. Sisters Inside has directly contributed to the prevention of the incarceration of countless women – saving the government hundreds of thousands of dollars. Further, the services and support provided by the organisation help women avoid criminal behavior once out of prison, thereby preventing further gaol sentences and decreasing government expenditure even more. Defunding Sisters Inside will not only inhibit these efforts, but cease them altogether. No other organisation provides these services, and they cannot be provided without the support of the government. The government’s decision is therefore counter-productive. Without Sisters Inside, the Queensland Government, and furthermore its taxpayers, will pay more money for a worse outcome. As you must be aware, the UQ and QUT Women’s Collectives are not alone in voicing opposition to this decision. There is currently a petition by Get Up! with 16,132 signatures as of August 22 – and doubtless, more will have signed since we have sent this letter. The goal is to reach 20,000 – that will be 20,000 individuals who do not want to see this invaluable service lost from the Queensland Community. You can find the petition at http://www.communityrun.org/petitions/save-sisters-inside. The public outcry this represents reflects the real benefit to the people of Queensland provided by Sisters inside, their appreciation for what the organisation has given the community, and a strong desire to ensure its services continue. We strongly urge the Queensland LNP to rethink its decision, and perhaps more importantly, to consider the philosophical implications of ignoring the people it deems to support and represent. This service supports women who need it most, when there is no one else to support them; and furthermore, it actually saves Queensland taxpayers money. There are plenty of reasons to fund Sisters Inside, but no valid reason to defund it. We look forward to reading your reply in regards to this matter, especially the government’s explanation as to why Sisters Inside inc. has been defunded. and the QUT Women’s Collective.